March 16, 2017 /0 Comments/in Press Releases /by XFIT Brands, Inc.
LAKE FOREST, CA / ACCESSWIRE / March 16, 2017 / XFit Brands, Inc. ($XFTB), a global supplier of fitness, impact sports equipment and sports surfaces whose brands include Throwdown, Transformations, EnviroTurf and GlideBoxx, today announced that it has debuted its latest premium partner program with EVERYBODYFIGHTS (EBF) for their franchising program launch at the IHRSA Tradeshow in Los Angeles, CA. This extension of the EBF relationship further expands XFit’s already strong breadth and depth in the premium health club segment. “We truly appreciate the partnership with XFIt Brands on many levels. It was key that we identified a team with a passion for both fitness solutions and manufacturing excellence, which was also a scalable supply chain partner. Xfit Brands truly understands the full range of our needs stretching from consistent quality, safety, and flawless execution to direct-to-consumer products that support our recurring merchandise revenue model. Our latest location in the Financial District of downtown Boston will be the first EBF Club to feature the full array of innovative EBF-tailored equipment and products produced by XFit Brands,” stated Hannibal Myers, President of Development and Franchising for EveryBodyFights. “This was a very exciting event and we’re glad we were able to play such a role in the launch of the EveryBodyFights Franchise Program. 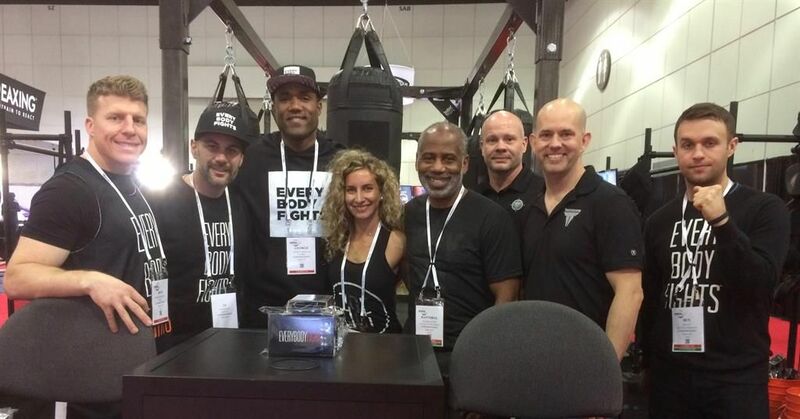 Our team has truly enjoyed collaborating closely with George Foreman III and the entire EVERYBODYFIGHTS TEAM over the last 12 months to support the growth of this one-of-a-kind boxing fitness concept. EBF has really differentiated themselves in the fitness marketplace with the best quality equipment and soft goods which will ultimately enable EBF franchisees to maximize the growth of their membership base.” commented Ted Joiner, President of XFit Brands. IHRSA, the International Health, Racquet & Sportsclub Association, is a health and fitness industry association serving the global health and fitness community. EverybodyFights (EBF), a groundbreaking boxing-fitness gym concept founded by George Foreman III, has been recognized as the best gym in Boston for two consecutive years. Its award-winning group class programming is based on all four modalities of true boxing training. Through this programming, EBF believes each class participant can learn to unleash the fighter within to better handle life’s challenges. EBF franchises a compelling in-gym concept and a robust six-revenue stream standalone concept. This press release contains forward-looking statements that are made pursuant to the safe harbor provisions within the meaning of Section 27A of the Securities Act of 1933, as amended, and Section 21E of the Securities Exchange Act of 1934, as amended. Forward-looking statements are any statement reflecting management’s current expectations regarding future results of operations, economic performance, financial condition and achievements of XFit, including statements regarding XFit’s expectation to see continued growth. The forward-looking statements are based on the assumption that operating performance and results will continue in line with historical results. Management believes these assumptions to be reasonable but there is no assurance that they will prove to be accurate. Forward-looking statements, specifically those concerning future performance are subject to certain risks and uncertainties, and actual results may differ materially. XFit Brands competes in a rapidly growing and transforming industry, and other factors disclosed in the Company’s filings with the Securities and Exchange Commission may affect the Company’s operations. Unless required by applicable law, XFit undertakes no obligation to update or revise any forward-looking statements.